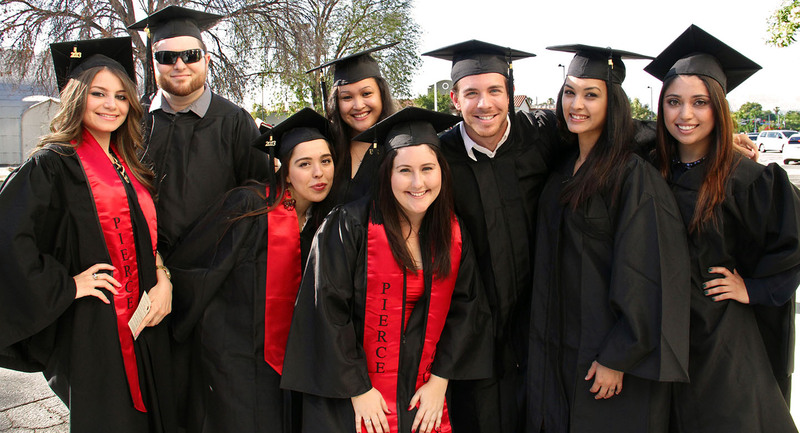 Special Thanks to the Pierce College Associated Student Organization for their generous contribution in supporting Commencement! Congratulations, we look forward to celebrating with you! Candidate Check-in: Faculty and Staff Center, Bldg 600 no later than 5:30 pm. Commencement Ceremony Information Sessions: Information sessions are optional but we encourage you to attend one of the dates listed above. The information session will last approximately 30 minutes. Tuesday, June 4, 2019, at 6:00 P.M.
PARKING/GUESTS: We recommend you park in Lot 7; it is closest to Rocky Young Park. Parking is free. There is no limit to the number of guests. However, seating is limited on a first-come, first-seated basis. ASSEMBLY: The commencement will begin promptly at 6:00 p.m. with the processional. Graduates should assemble not later than 5:30 pm in Building 600 (located across the quad from the ASO Office). There will be staff directing you. Arrive dressed in your cap and gown. Procession leaders will circulate through the line and distribute name cards. If you want to sit with your friends, make sure that you line up behind them, not side-by‑side. You will line up in two rows and proceed along a main aisle, and then divide into separate columns to enter the aisles leading to the rows of seats. STUDENTS WITH PHYSICAL DISABILITIES: Students with physical disabilities who are unable to walk to the stage will be seated prior to the beginning of the ceremony. Any physically disabled student who will need assistance must contact Genice Sarcedo-Magruder in the Office of Special Services at (818) 710-3318. Special arrangements will be made for those students to participate in the ceremony. CAP, GOWNS, AND TASSELS: Graduation apparel is available for purchase at the College Bookstore. Please note: ONLY Nursing students are permitted to wear white caps and gowns. All other students MUST be robed in a black cap and gown to participate in the commencement ceremony. Prior to the procession, position the tassel on your mortarboard (hat) on the right side. At the end of the ceremony, you will be instructed to switch the tassel from the right to the left side. When marching in the recessional, the tassel will be on the left side to signify that you are a graduate. NAME CARDS: On the day of the event, name cards will be given to students eligible to participate in the commencement. Clearly print your name on the card. You will keep the card with you until you walk the stage. You will give the name card to the announcer at the podium. The announcer will keep the card and give it to the photographer at the end of the ceremony. The announcers have been instructed not to read additional comments written on the cards. The photographer will take a picture of you as you receive your in-lieu diploma. ORDER OF PROCESSION: The first person to enter is the Bearer of the Mace (the senior faculty member), followed by the faculty, staff, emeritus, and administration. They will form a line in the center aisle for the graduates to walk by. Then the candidates for graduation enter, walking down the center aisle. The right-hand column will turn into the first aisle. The left-hand column will proceed to the further aisle to the seats. The platform party enters. Finally, the procession leaders will direct you to your seats. DIPLOMAS: At the ceremony you will receive a small scroll that is an “in-lieu” diploma. 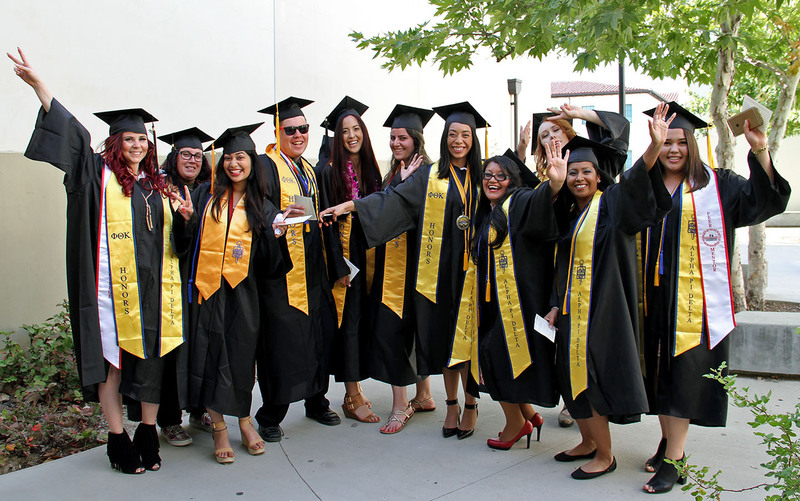 The Graduation Unit within the Admissions Office will notify you by email when your diploma is ready to be picked up. It usually takes six months after you have completed all of your coursework. Degree conferral is contingent upon final evaluation of your academic records. COMMENCEMENT PHOTOGRAPHS: As indicated above, photographers will take pictures of each student as they receive their in-lieu diploma. If you provide your contact information on the name card, Grad Images will send you photo proofs. You are under no obligation to purchase photos. RECESSIONAL: You will exit the ceremony in reverse order. The platform party will exit first, followed by the faculty, administration, etc. Student graduates will exit after the faculty, row by row. Remain standing until your row is cleared for exiting. Caps and gowns will be available in May at the bookstore through the day of graduation while supplies last. Students will be wearing the traditional black cap and gown. Note: Nursing students must be wearing white caps and gowns. Cost: see bookstore web page for pricing and available options. Announcements, sashes and specialty cords are available through the bookstore. Jostens will be providing graduates with invitations, class rings and other jewelry. You can view their selection online by clicking on the logo. Grad Images will automatically take pictures of you as the College President shakes your hand. There are no fees for this service or obligation to purchase. Just be sure to complete and submit reader cards with your address information to the Campus Center where you will assemble. Free proofs will be mailed to you, and online viewing will be available to facilitate the order process. This will allow your guests to relax in their seats and enjoy an unrestricted view of the graduation ceremony. Receive a $5 credit off of a $25 purchase for pre-registering today!